Tribal, Jungles and Rhino Tour is a best way to initiate the journey to explore the isolated north eastern tribes. Focusing around Arunachal Pradesh, the land of 20 major tribes, the tour is an enchanting excursion through the evergreen forests, numerous streams, rivers, deep gorges, lofty mountains and snow shining peaks housing thousands of flora-fauna species. This tribal tour of Arunachal Pradesh explores the tribes of Dirang Dzong, Mompa and Aka during this wholesome 13 day journey. An add on to this tour is a worthy visit to Kaziranga National Park, famous for one horned rhinoceros, Royal Bengal Tiger, elephant, Indian bison, leopard, Sambhar and hundreds of varieties of birds. 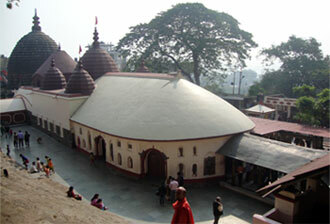 Upon arrival at Guwahati airport, meet Incredible India Tour representative for assisted transfer to the hotel. Take an afternoon trip to the Kamakhyadham tantric temple, the most significant site in the area. Also visit Assam State Museum which forms an enriching experience to know more about informative tribal culture displays. Ground floor here features an exciting large sculpture collection and one also gets to walk through the reconstructed tribal homes here. Return to the comforts of the hotel for overnight stay. Transfer by road to Bhalukpong, a small town located on the Assam and Arunachal Pradesh borders. Here, an overnight stay at the riverside eco camp is scheduled. Commit for fish angling and river rafting here, followed by evening campfire and cultural event in the camp premises. Overnight stay in camp. A day spent around Dirang is full of enchanting experiences where a tourist will get to meet the locals of Monpa Stone Village. Also visit the local gompa here. 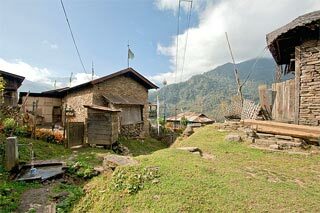 The valley is known for its rice and crop fields and offers the eco-friendly side of Arunachal Pradesh. Overnight in Dirang. Check out Dirang Dzong for a journey onward Tawang. Drive over Sela Pass (13,700 ft) to Tawang. Sela is world's highest motorable mountain pass located in Tawang. This pass connects the Buddhist Tawang to Tezpur and Guwahati and is the main road connecting the state with the rest of the country. Upon reaching Tawang, transfer to the local guest house for overnight stay. Tawang is a cultural hub of Arunachal Pradesh known for its spectacular mountainous terrain accommodating many Buddhist monasteries and Monpa villages. This day, tourists visit the Monpa tribal village. After lunch, a visit to Pitisu Lake is scheduled. This is an enchanting wonderland located close to the Tibet/Arunachal border. Return to Tawang for overnight stay in the city. Visit Tawang Monastery / Gompa, the biggest attraction of Tawang. Backdropped by snow clad mountains; this is considered as the world's second largest Buddhist monastic complex. The monastery also boasts a famous Buddhist library known to preserve many ancient Buddhist texts. Also visit the other nunneries of Tawang, known as Ani Gompa. The oldest Ani Gompa is Brama Dung Chung, located 12 km from Tawang. Also, visit the traditional crafts center. Here, the craftsmen and artists make Monpa tribal masks in a unique way. Return by road to Dirang Village. Overnight in guest house. 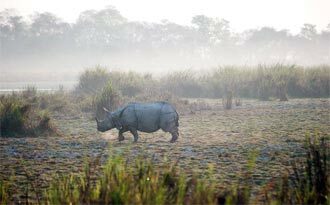 Check out Bhalukpong for the next iconic destination of Tribals, Jungles and Rhinos Tour, Kaziranga, famous for sheltering one horned rhinoceros. Upon arrival, check in the forest lodge for overnight stay. Explore the world heritage site of Kaziranga National Park atop Elephants or via Jeep safari. Spot the icon of Assam, rhinos here. For best views of rhinos, swamp deers and elephants; venture into the central range. The bonus of the visit to this national park is viewing its enchanting bird life (take binoculars for detailed bird watching). Overnight in a forest lodge. Check out the forest lodge and drive to the tea city of Assam, Dibrugarh. On route, visit Sis agar, the heritage site of 600 year old Ahom monuments. Upon arrival here, check in the Heritage Chang Tea Estate Bungalow at Mancotta road. This is a 157 year old British era tea estate, where tourists can even stay and explore the tea farming. Transfer to Dibrugarh airport for departure to Kolkata or Delhi.